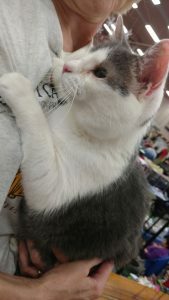 Muffy is a 3-year-old gray and white female. Her right eye was severely infected when she was rescued and had to be removed. She is slightly visually impaired in her left eye. She is looking for a forever home with some special TLC!